Born in 1970 in Shanxi, China, Liu Ruo Wang creates art that touches on an immense array of cultural elements, while still remaining firmly rooted in a personal journey through time and struggles. 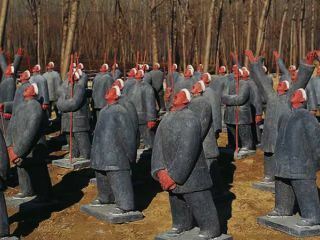 Turning a childhood of myth and folklore into a representation of the Chinese spirit, the artist chooses to glorify ordinary man in an emblem of solidarity, tying together bands of soldiers in distinctly Eastern colour, texture and form. A coalescence of nostalgia and tribute, the artist immortalizes his roots, while subtly addressing conceptual trails into the history and significance that form the rich heritage behind the industrialized modernity of his people. Widely established and exhibited, the artist’s works are collected by numerous prestigious institutions in China, Singapore, Hong Kong, Korea, France, Italy, New Zealand and the USA. I'm interested in this The East is Red Series (东方红系列) (4) 2014.10.21 by Liu Ruo Wang . Please advise availability and price. Thank you. 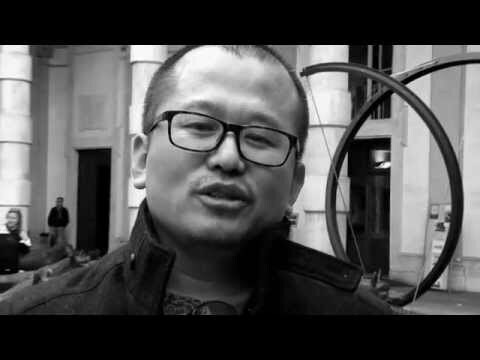 Liu Ruowang, a young sculptor, has always focused on history, reality and modern souls. His talent can be perceived from works like Red East, Heaven Soldiers, People, Asking the Heavens and Wolves are Coming. Some critics believe heroism is the prominent feature of Liu’s works, while in fact; aestheticism is also what he is after. Idealism and romanticism are perfectly integrated in this young sculpture and artist. Liu presented grand and magnificent sculpture art before us in an era of low interests and mediocre pursuits. 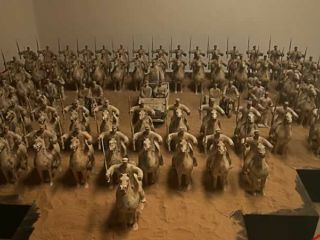 We are impressed by his majestic and powerful strength and passion for ancient Chinese culture. Drawing upon references from traditional sculptures, Liu didn’t simply imitate their graphic patterns; what’s more, he used them for reference on the basis of thinking of the traditional culture as a whole. Liu’s works demonstrated rich Chinese characteristics with magnificent oriental aesthetic traditions—original free brush styles, the decorative styles of tomb figures from the Qin dynasty, idealized design styles of Buddhism, stereotyped and exaggerated styles of the Emperor’s graves and the plain expressive style of the general public. Liu dwells in his own imaginative space, deliberately keeping a distance from today’s fashion. There are not only elements from the Han, Wei and Tang dynasties, but also modern passion in the old forms of all ages. Artists share a feeling, a subconscious current of their lives that can be transformed into the passion for art and thus create various art images. That passion comes from living environments, educational backgrounds and natural instincts, but are determined by ideological levels and artistic accomplishments. All these factors combined resulted in individual characters. When personalities ascend to aesthetic attitudes, works full of passion are created. Liu was born in Jiaxian County in northern Shanxi—the hometown of the great song The East is Red in the late 1970s. Rich and splendid civilizations that lived along the Yellow River and loess plateau provided him with plenty of inspirational material. 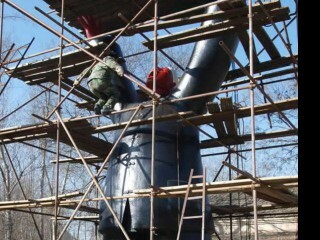 Some critics often mention his identity and his short stay in Beijing, which are important factors for his creation. As part of the Chinese culture, both Loess land culture and emotion for the old city influence the artist deeply. An artist's resume is always a result of multiple forces, combining identity and experiences as well as personal understanding and pursuit of art which is connected to a time’s aesthetic and cultural environment. The ultimate goal, however, is to truly reflect their attention, understanding, questioning of reality and modern souls. Liu’s works do well in this aspect. “Liu’s works all demonstrate a vigor that erupts in different forms and expressions. It must come from his youthful ambitions as well as those of a rising Chinese nation. That’s the most valuable thing in such an era lacking faith. Like Liang Qichao once said "faith is sanity. It’s the vitality of both people and society,” said Yin Shuangxi, a well known critic. In my perspective, Liu’s works are an outpouring of strength and momentum like roaring storms, running waves, lightening across the universe and thunders rocking mountains. This is exactly what our time needs. Though Liu’s works are still “man-made”, there’s no doubt that he has found an art form closer to life and souls. Spirits vanish when artists treat grand propositions like “temporal spirits” with profiting desires. Art only transcends technical levels when artists get lost in their own creation and enter a spiritual experience. Liu’s works are created by following his heart and that’s why his works exhibit a harmonious inner strength. They are neither pure and simple art works, nor “spiritual duplicates” against art, but aesthetic perceptions of soul. I remember Hegel once made such an aesthetic judgement: in symbolizing art, material forms weigh heavier than spiritual contents; classical art is the perfect combination of material forms and spiritual contents; in romantic art, spiritual contents weigh heavier than material forms. According to this classification, I tend to regard Liu’s works as romantic art. 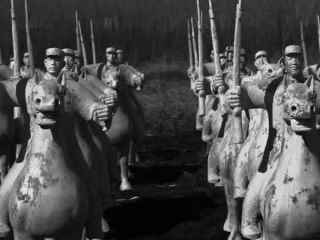 People perceive an ideal and passion of an era in Liu’s magnificent works such as The East is Red, Heaven Soldiers, People, Asking the Heavens, Wolves are Coming and Guard of Honor with Cars and Horses. Liu’s works are more about his emotions and ambitions. The appeal of sculptures not only comes from sculpture itself, but also from its connotations. There are ambitions fulfilled as well as failed. It is these cultural deposits that led Liu’s works to a splendid state of "a gale has risen and is sweeping the clouds across the sky". Liu’s works are not all solemn and stirring, his delicate works are also touching. Gaoshi mentions that the recluse does not associate with undesirable elements. His strong will and independence was revealed in Liu’s new Portrayal of Gaoshi series, choosing to “pay attention to one’s own moral uplifting without thoughts of others” and “discarding all desires and worries from one’s mind” instead of “taking care of the whole world”. These perfectly calm figures were like fairy gods with long faces and full cheeks, long mustaches and bamboo hats. Liu “absorbed techniques of the ancient masters and expressed his own feelings through nature.” (Quoted Zhang Boju) He created images without entirely relying on forms, transformed realism painting into freehand and lifted artistic conceptions to a higher level based on Chinese sculptural traditions. In image-creating, Liu employed both fine brush and free hand, taking care of both square and round elements. He didn’t vividly imitate clothes rippling in real life, but created a sense of volume with lines and surfaces, showing dynamism in a static motion. This skilful combination of lines and surfaces formed a visual effect that more readily expressed the Chinese literati’s personal characters—amiable, kind, firm and persistent. It also resonates with Chinese ancient culture, which makes China’s conservativeness more apparent in an aesthetic sense. 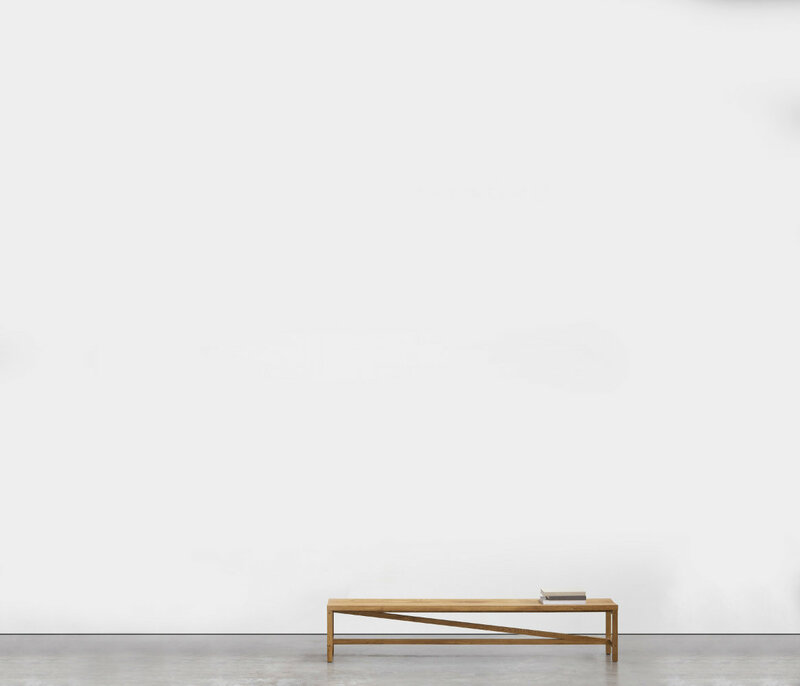 We see Liu is approaching the inner side of sculpture and expressing his spirit with sculpture; language, growing more introvert and prudent from his arrangement of Chinese elements—perfectly round appearances, simple designs and the unsophisticated atmosphere. I am reminded of Bo Ya’s (a musician in the pre-Qin dynasty) adept playing of the dulcimer upon seeing Liu’s new work Lofty Mountains and Flowing Water. 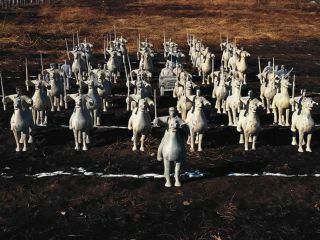 In it, Liu skilfully blended traditional Chinese martial arts with portrayals of soldiers in the pre-Qin dynasty with simple lines, round bodies in bronze. Liu put the original roundness and classical serenity into an eternity of strength and condensed mobility, which reflected the esteem for human history and development as well as human’s strong vitality. A contemporary art charm was added to his work through these open gestures and the expression of mobility and stillness. You can’t help but be led to meaningful afterthoughts when indulging yourself in viewing those bronze sculptures. They are like running water, sometimes rapid, sometimes slow, torrents in history that witnessed numerous ups and downs in life. Like a giant dragon roaring into the sky or an awe-inspiring lion, the wisdom of the human race made it possible for a long-lasting Chinese civilization. Liu’s works showcase an accumulated, plain and pure charm because he has a profound understanding of Chinese history and is sensitive and has good taste about sculptural spatial language and form. This doubtlessly shows that Liu has mastered the essence of ancient Chinese fine culture and traditional sculptures, and applied it into his works. 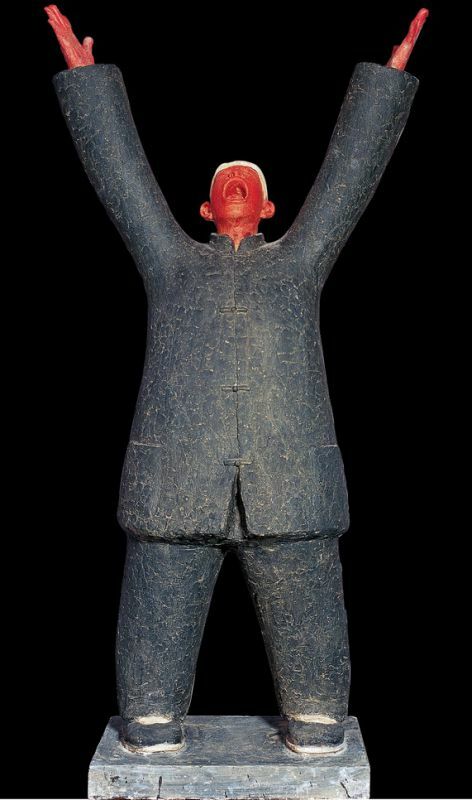 Liu’s unique sculpture style has formed contemporary reality with traditional Chinese aesthetic thoughts as its core, augmented with western romanticism and humanitarian aesthetic thoughts. Sculptures have always established aesthetic orientations between form and spirits. Liu formed his “freehand brush” style with clear structure, meaningful design and implicit technique. The works demonstrate vigor and vitality, with inner strength and beautiful outer form. Today’s art calls for artists with deep thoughts about art, who are closely related to real life. Only by being as such can they create exciting and creative works. There is a long, hard journey to go for Liu, who has already made some significant achievements. We believe he will keep striving to do better and gain even greater achievements with his efforts.